When I was a kid we spent nearly every New Year’s weekend with my parent’s college friends, known to us as Aunt Janet and Uncle Bailey. They had two kids who were close in age to ours and we always had a ton of fun together. Being as we lived in Southern California the Rose Bowl game was once on the docket for New Year’s Day festivities. Before the game we had a picnic lunch. I can’t tell you what we had other than Aunt Janet’s Sour Cream Chocolate Chip Cake. It was memorable. I’ve wanted to share this recipe with you for a long time but felt like I should first get permission from Aunt Janet. I saw her last week at my niece’s wedding and we had quite the discussion about the cake. Apparently, it came from Sunset Magazine sometime in the 1950’s. The cake is super easy to make, travels well, and is just the right little after dinner treat when you’re eating out of a picnic basket. Aunt Janet claims it’s a great cake to make with your grandkids, and although I haven’t actually had the pleasure of doing that yet, it did get the nod of approval from a certain six-year-old I know. I always think of this cake as a New Year’s Cake because that’s when I first had it but truthfully, it’s good any time of the year, at home or away. As my granddaughter pointed out, it’s more like brownies than cake so if you’re dreaming of wedding cake kind of flavor you’ll be disappointed but if you think of it as a brownie substitute you’ll love it! And, if you’re still trying to figure out what to bring to your 4th of July picnic and just aren’t up for making a blueberry, strawberry pie with stripes and stars across the top, this will get you out of the kitchen in a hurry so you still have time to get to the parade and festivities. Enjoy! I always bake in a stoneware pan but if you plan to bring it to a picnic you might want to use something more portable. Mix butter with the 1 C. sugar until blended. Beat in eggs, one at a time. Stir flour with the baking powder, soda, and cinnamon. Blend with creamed mixture. Mix in the sour cream. Pour into a greased and floured 9 x 13” pan. 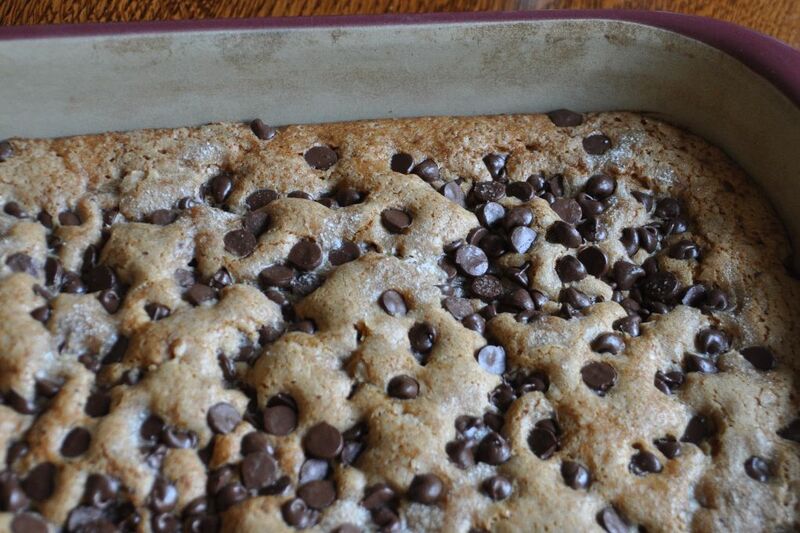 Scatter the chocolate chips evenly over the batter then sprinkle with the 1 T. remaining sugar. Bake at 350° for 35 minutes or until cake just begins to pull away from sides of pan. Serve warm or cooled. Do not refrigerate. Cut in rectangles. 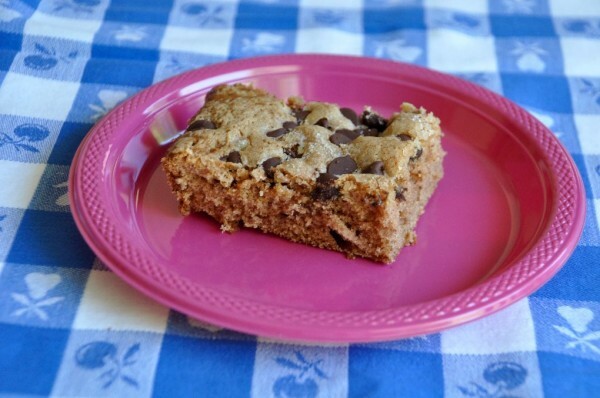 This entry was posted in Food Glorious Food and tagged cake, Chocolate Chip Cake, picnic on July 3, 2017 by Nancy. What a lovely childhood experience/tradition. Thank YOU for sharing …. love both the story and the recipe….and you!